?The products featured below are purchased blank (not engraved). If you would like LaserGifts? to engrave the product for you, please click here. 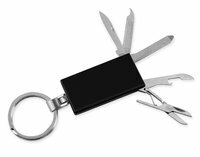 This handy metal pocket tool has a high quality aluminum case and 8 tools including: scissors, can opener, file, knife blade, flat head screw driver and ruler. Black. Size: 1 1/4" x 1/4" x 5 1/4" long when opened. Revolving Oak Counter Display. Customize the display to suit your needs. Measures 9" x 9" x 19". All rights reserved. Copyright LaserGifts 2019. Laser Gifts assumes that our clients have the legal right to use any and all trademarks and copyrighted material supplied to us for reproduction. Any trademarked or copyrighted material depicted herein is the property of their respective trademark and / or copyright owners.